Losing Fat by Intermittent Fasting 15 - Muscle Loss? One of my concerns regarding fasting was the possibility of muscle loss. I mean the phrase 'muscle loss' has been bandied about many times in most of what I've read especially in the context of fitness or bodybuilding. I've been into muscle training before and I still have plans to workout in the future. Especially now that I'm losing weight, I'm anticipating loose skin. I'm hoping that building up muscle would help hide it. Does Fasting Result in Muscle Loss? 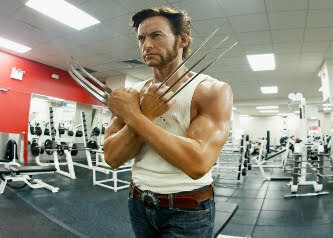 The Wolverine Diet doesn't seem to say so. "However, you must be training in a fasted state, just like Hugh does in the early morning hours. According to a study by the Research Center for Exercise & Health out of Belgium, less glycogen is burnt during fasted training with higher amounts of fat being burned off.Because you are left with more glycogen, you have more energy while reducing your body fat percentage." "According to another study by the Department of Biomedical Kinesiology, your body receives a larger anabolic spike with your post-workout meal following fasted training. This means that your muscles may grow more quickly in a shorter period of time, but you’ll see better performance in the gym." Does Fasting Result in Loose Skin? From the many fasting stories on videos I've seen, it appears that yes, it does. But loose skin due to fasting seems to appear on persons who have been very overweight or obese for a long time. A "long time" would probably mean "most of one's adult life". Dr. Jason Fung in his video lectures and documentaries, however, gives the examples of prisoners in concentration camps who did not have loose skin. Sure, they lost a lot of weight - they had to - especially in concentration camps. But yes they didn't seem to have loose skin. And the reason, in my opinion, is because most were not overweight or obese when they were subjected to the weight loss. So because they didn't have massive bodies, the weight loss just left them with thin bodies akin to skin and bones. Because of the little success I've been having with Intermittent Fasting, I'm about ready to move it up to the next level. Just "about" as I'm still contemplating on it. Currently, I'm doing the 1 Meal-a-Day eating pattern for 2 days in a week. I've been eating "Dinner Only" on Mondays and Wednesdays. For Tuesday, Thursday, Saturday and Sundays, it would be my normal eating pattern, meaning 3 meals-a-day. Last week, especially, it was easy. What I plan to do now is to move it several notches higher and this would mean doing the 1 Meal-A-Day pattern to 5 days straight - Monday to Friday. For Saturday and Sunday, the protocol would be 2 Meals-A-Day. 2 Meals-A-Day would mean 2 consecutive meals, usually lunch and dinner. This would also mean a fasting-feeding ratio of 16:8. That stands for 16 hours fasting and 8 hours feeding. Sounds doable.